Baking with whole wheat is one of my favorite as I love the nuttiness of the whole grain. 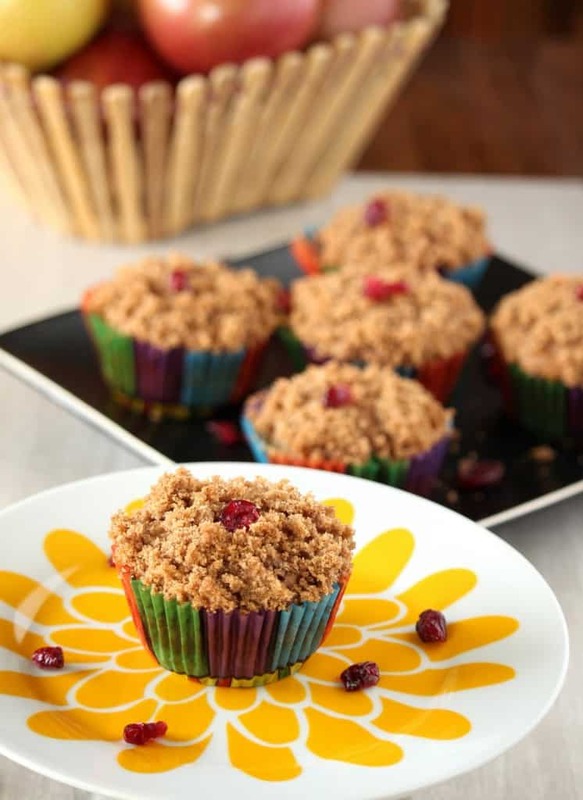 These whole grain Apple Cranberry Muffinsare my ever favorite. Anytime a recipe calls for all purpose flour, I try it once as is, then I try it with 50% wheat flour substitution and sometimes I completely replace the refined flour with whole wheat. I have to say though that not all recipes work great with whole wheat. There are some recipes that just needs the all purpose flour. 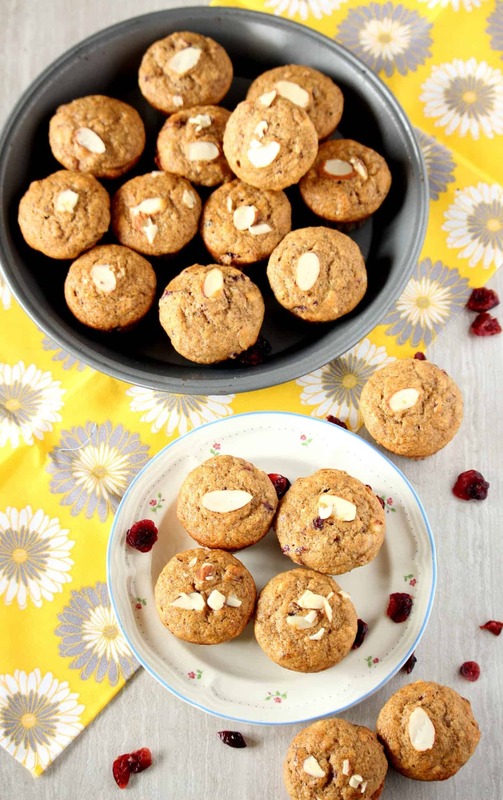 But as a trend, I have noticed that whole wheat pastry flour works very well when substituted for all purpose flour like these Whole wheat Banana Pineapple muffins. 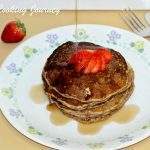 This recipe, I have not used the pastry flour, but have used the whole wheat flour that I bought in bulk from the local produce. 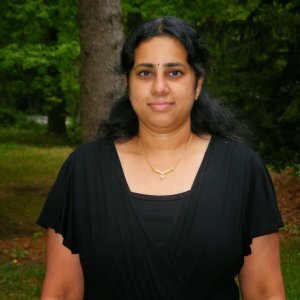 I simply love shopping in that store as they have a wide variety of whole grains in bulk that I can pick as less or more as I want. This has highly reduced the wastage in the house. I usually just use the aata or the wheat flour that I buy from Indian stores, but this time I used the whole wheat flour from the local produce. The muffins turned out absolutely moist and soft that I will never ever try out refined flour to make this again. Adding the spices in the muffin took the flavors to a different level and I was almost dreaming of fall season. Adding the streusel topping is entirely optional but I would highly recommend it as the muffins were very less sweet without the streusel. I also enjoyed the extra crunch that I got from the streusel. 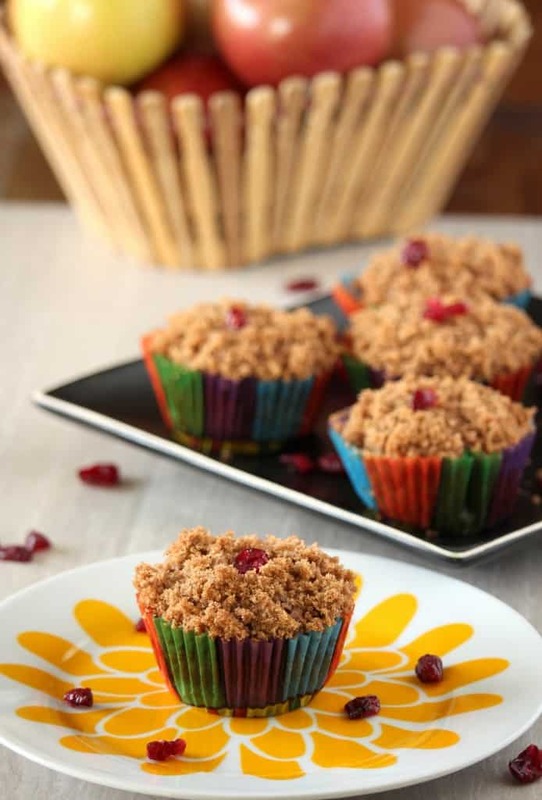 If you are thinking of making the muffins without streusel, add a little bit more brown sugar or honey in the muffin mixture. 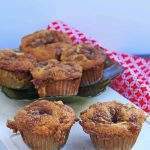 I used Fuji apples to make the muffins and it added a little bit sweetness to the muffins. 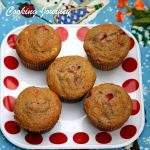 The cranberries added a lovely texture and a tinge of tartness to the muffins which worked great. In a bowl, combine all the dry ingredients and keep it aside. In a larger bowl, whisk together the wet ingredients until well combined and smooth. 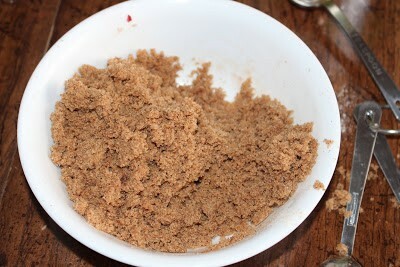 Now add the dry ingredients into the bowl and gently mix to combine. Do not beat at this stage as the muffins will turn out hard. Just mix to combine. Add the chopped apples and cranberries and fold in gently. Preheat the oven to 350 F. Line the muffin tins with liners and gently spray with oil. 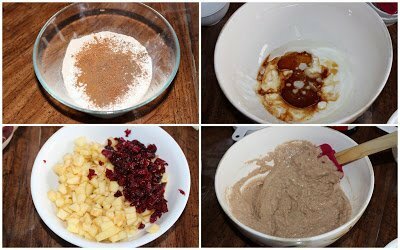 Combine all the ingredients mentioned under the streusel and keep it ready. 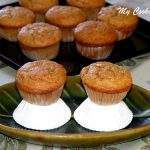 Fill the muffin tins about 3/4th with the batter. 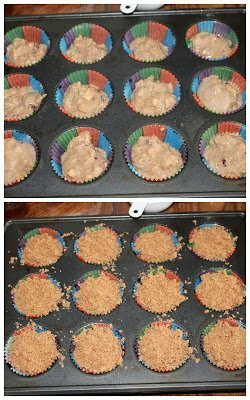 Evenly sprinkle the streusel topping on each muffin tin. Bake for about 18 to 20 minutes or until the toothpick comes out clean when pricked. Leave it in the tin for about 5 minutes to set and then gently take them out and place them on cooling rack to cool. Store in an airtight container when completely cool. I love muffins, especially for breakfast. These sound totally delicious and perfect flavours for the fall season. Those muffins simply look so inviting Sandhya..love this theme and feel so bad for missing it out!..will surely bookmark to make later! I love freshly baked muffins. 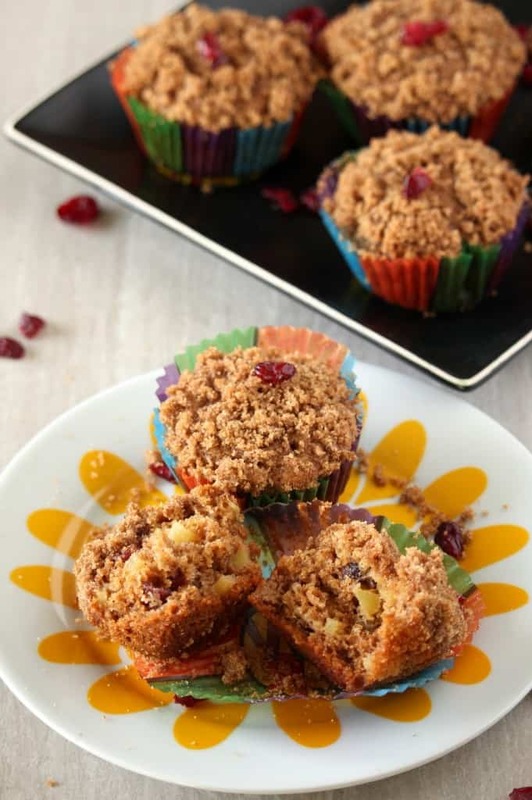 I’d be in trouble if I made these, I’d want to eat all of that streusel! 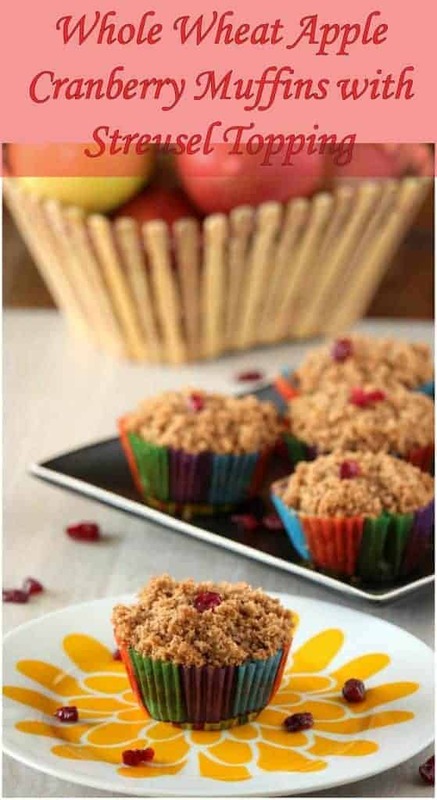 Apple and cranberry pair so perfectly together, and it’s such a fall/winter recipe. You’re right not all recipes taste good with whole wheat flour. I’ve tried many with whole wheat flour, and they were “off”. I’ll have to give these a go! I just started baking with whole wheat from time to time last year around the holidays. I was pleasantly surprised to have a whole wheat pie crust turn out amazing. 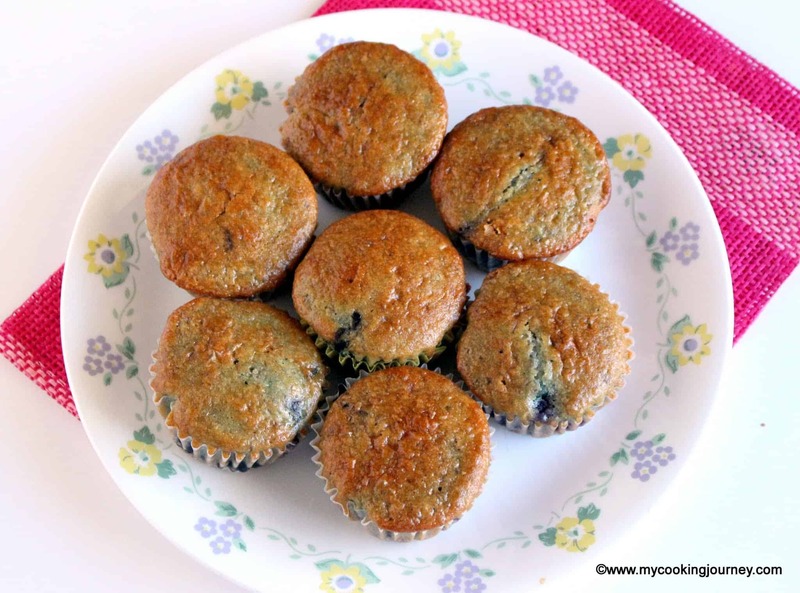 These muffins are right up my alley. This would be such a perfect breakfast treat for us over the weekends. 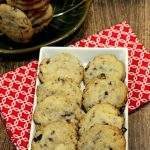 My kids love banana and cranberry so this is definitely our go to combination. 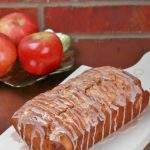 Love the topping and love that its’ whole wheat. I was just watching a show that was almost all about flour. They marveled at how people could live solely off of whole wheat bread if they ever had to. The stuff is nutrient packed! Of course! 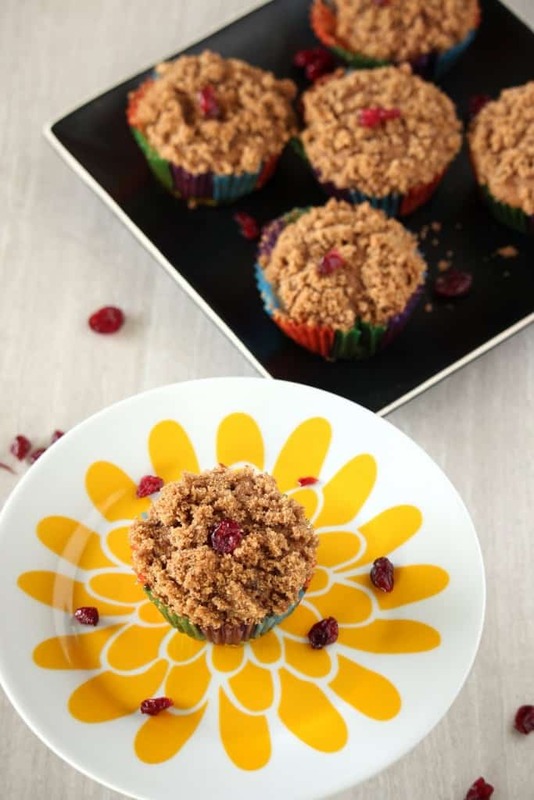 Apples & Cranberries are a combination I love in other forms … why didn’t I think of making muffins?! Thanks for sharing! 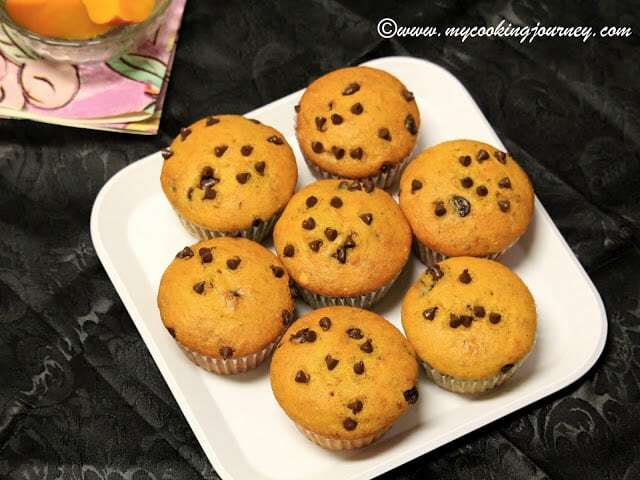 These muffins look wonderful! 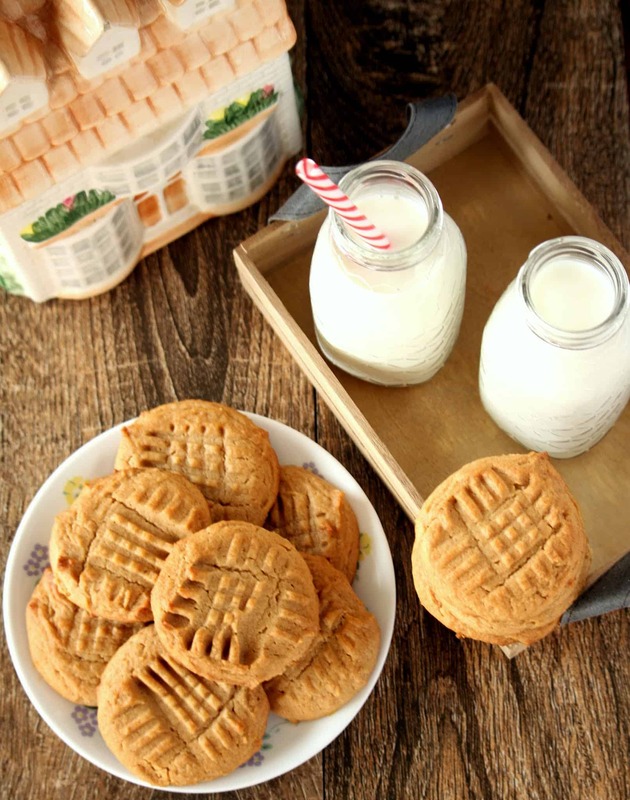 I’d love to have them in the morning with my coffee…that crumb topping is calling to me!